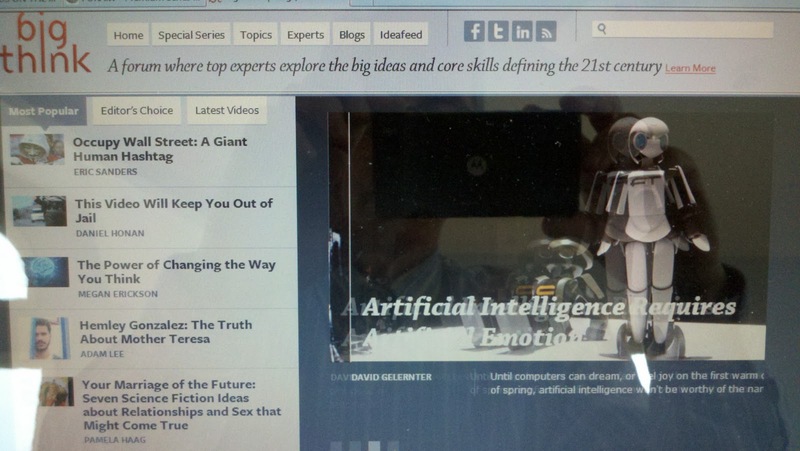 As this post is my last of 2011, I am recommending six websites, in no particular order, which are designed to educate, entertain, and inspire. They have achieved these objectives for me, so I hope you find them just as helpful. Some have appeared on this blog before, but they are worth a second or third notice. FORAtv provides live and recorded lectures, interviews, debates, and panels on business, environment, politics, science, technology, and culture from leading thinkers around the world. Founded in San Francisco in 2005, FORAtv boasts a stunning range of content partners and syndication partners. 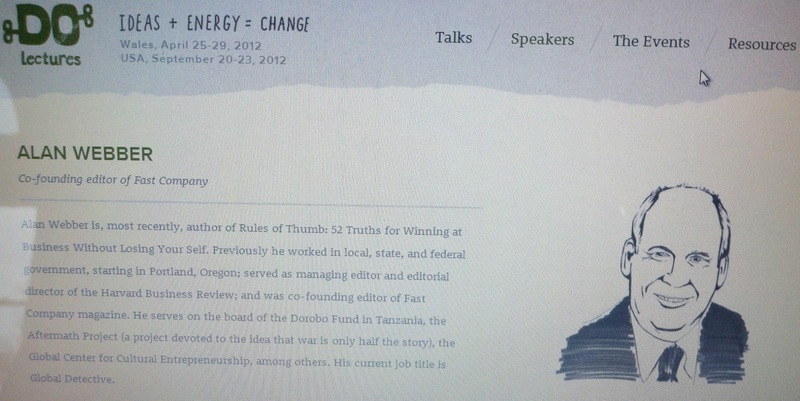 TED﻿ (Technology, Education, Design) has as its tagline "Ideas Worth Spreading." 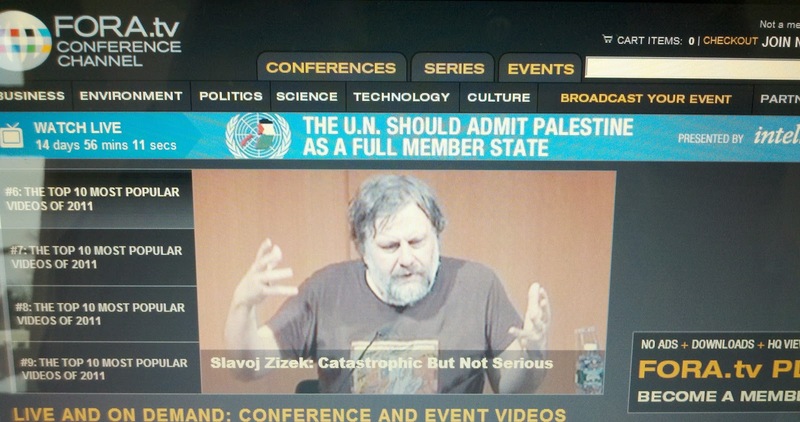 It started in 1984 and now broadcasts talks by world renowned speakers on diverse topics. 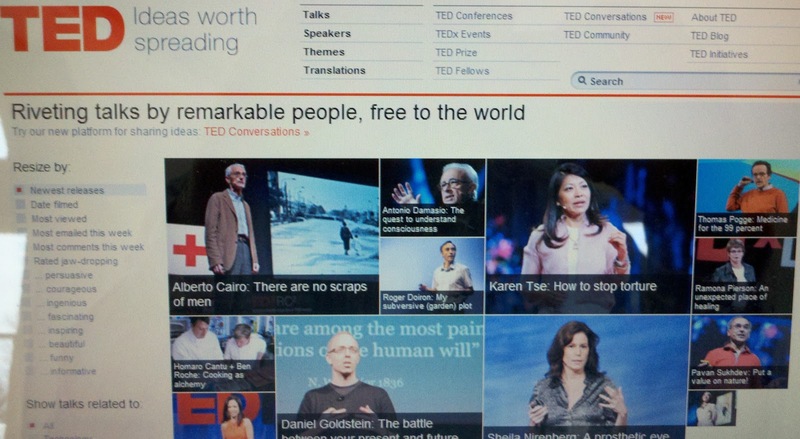 TED features two annual conferences, the TEDTalks video site, TED fellowships, and the annual TED Prize. 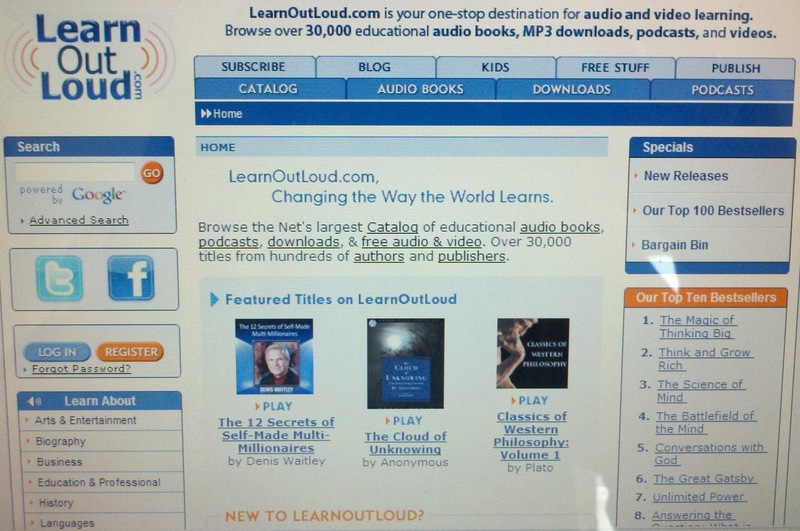 Learn Out Loud is an audio book and podcast site devoted to languages, literature, philosophy, politics, religion, science, technology, and travel, among others topics. Most of the content comes with a cost, but its ever-expanding database of free readings, lectures, webcasts, and webinars are worth downloading onto your smartphone or listening to by streaming. Several of these are semester length for those seeking in-depth content. 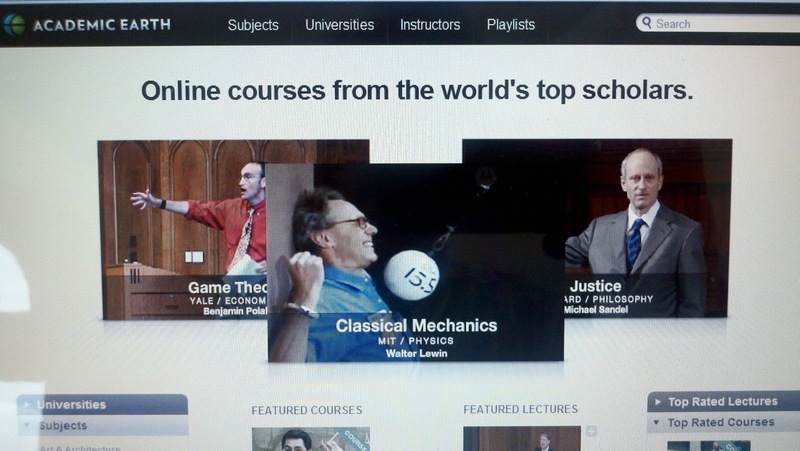 Academic Earth contains courses and lectures by professors from Berkeley, Columbia, Harvard, MIT, Princeton, Stanford, Yale, and other major universities on virtually every major subject area you're likely to find in higher education. 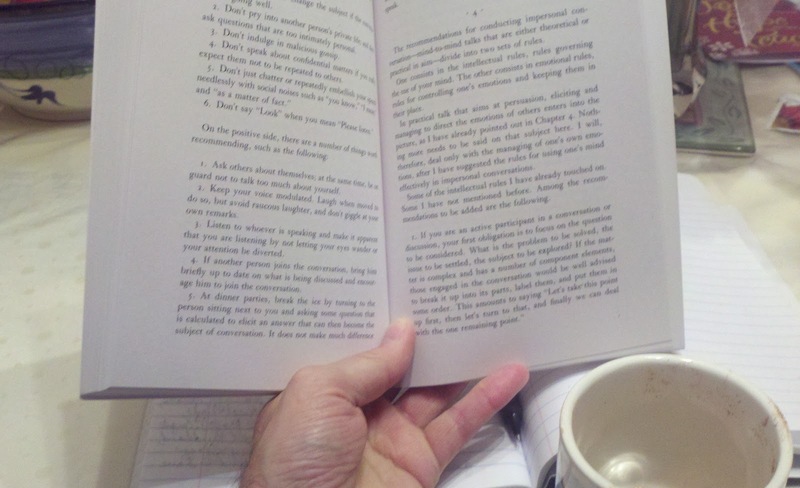 Some recent topics: literary theory, stock market simulation, the development of thought, and Paul's ministry. Do Lectures founded in 2005 by David & Clare Hieatt and based in Wales, has as it premise, in its own words, "people who Do things can inspire the rest of us to go and Do things, too. So each year we invite a set of people down here to come and tell us what they Do. They can be small Do’s or big Do’s or just extraordinary Do’s. But when you listen to their stories, they light a fire in your belly to go and Do your thing, your passion, the thing that sits in the back of your head each day, just waiting, and waiting for you to follow your heart." Here's to a 2012 of good health, self-realizing success, and important work at the service of others. When in Doubt Leave It Out? I Think Not! The old journalism maxim, "When in doubt leave it out," might work well in reporting news, but it might be counterproductive to principles of writing fast under pressure. Fair-minded reporters would not want to slander their subjects or jeopardize their reputation by writing statements they cannot verify, so they would do well to strike such thoughts from their news stories. As a tip for writing fast under intense deadlines, however, the adage is not as useful. The idea of composing quickly is based on creativity, not criticism, so writers who are planning and producing that first draft should take a no-holds-barred approach. Say as you're writing the first draft of a proposal for upper management, a compelling but unsubstantiated idea pops into your head. Why leave it out so early in the writing process? Write it down and flag it as a point for confirmation. Why risk deleting and forgetting it now when it can potentially lead to other great ideas to support your message? You can always strike it later if need be. 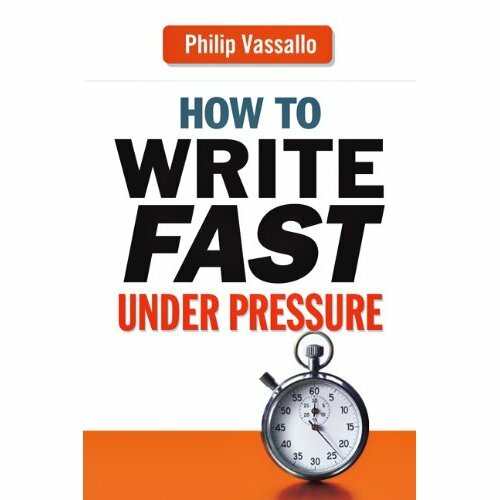 How to Write Fast Under Pressure examines this and numerous other tips for the business and technical writer. It is available in print and electronic formats. 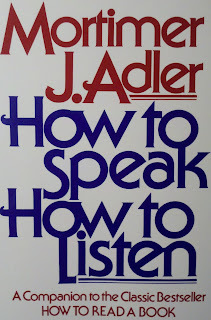 Mortimer J. Adler's How to Speak How to Listen makes several instructive points for the practical person seeking a theoretical framework as well as the novice professional speaker and meeting participant. These suggestions also connect well to writing at work. 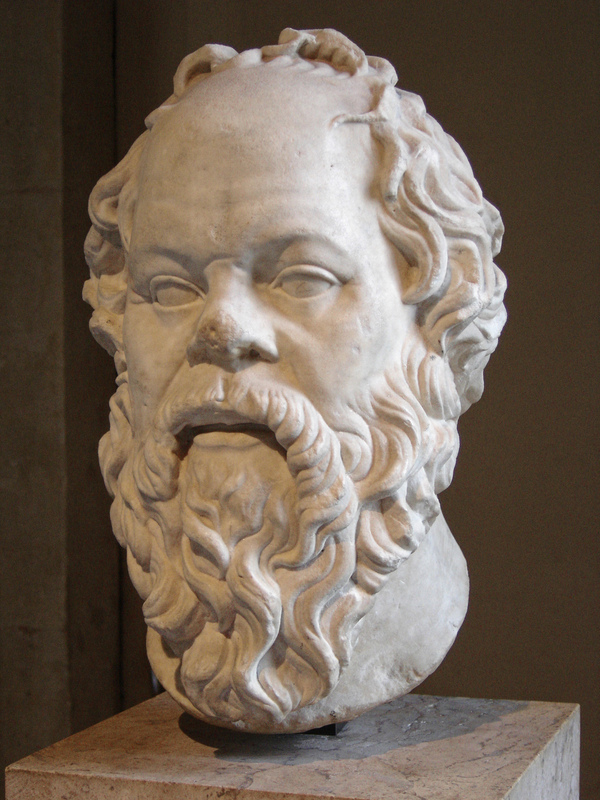 Adler suggests an order for introducing into a presentation Aristotle's time-tested tripartite of persuasion as follows: ethos (credibility), pathos (emotion), and logos (logic). In addition, he examines two indispensable considerations of speech preparation, once again borrowing from Greek: taxis (the structure) and lexis (the language). "Always risk talking over (your audience's) heads." "Truly great books ... are the few books that are over everybody's head all of the time." In speeches, "On the one hand, the language employed and the sentences constructed should be clear without being plain. On the other hand, they should have a certain elevation above the ordinary without being obscure." 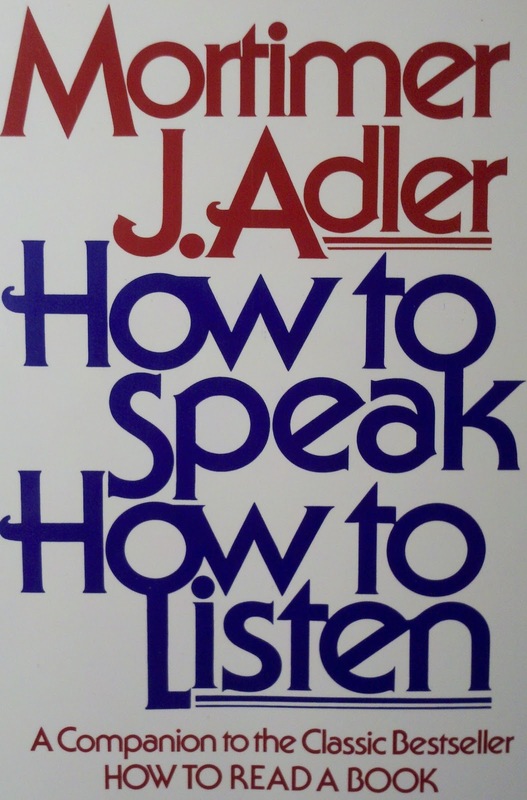 "The most prevalent mistake that people make about both listening and reading is to regard them as passively receiving rather than actively participating." "To disagree before you understand is impertinent. To agree is inane." The coffee cup is empty, but the reading never ends. ﻿ ﻿﻿﻿﻿I remember baseball player Pete Rose, in the midst of his legendary National League record 44-game hitting streak, saying, "I'm not the fastest runner and I don't have the strongest arms, but by legs and my arms are my greatest assets." That's the way I feel about my reading and writing abilities. I may not be the fastest reader or the most skilled writer, but I am forever grateful for those skills, which have been not only my livelihood but my means of better understanding the world and deepening my perspective on the purpose of existence. I wake up an hour earlier than I have to for the privilege and pleasure of reading the book of the day. I'm one of those people who read six or so books at a time. While I'm at it, I keep nearby my notebook, the low-tech type, to list observations about my reading, to jot notes on a program I'm designing for a client, to capture an otherwise fleeting creative idea, or just to document recent experiences. Taking a break from note taking. 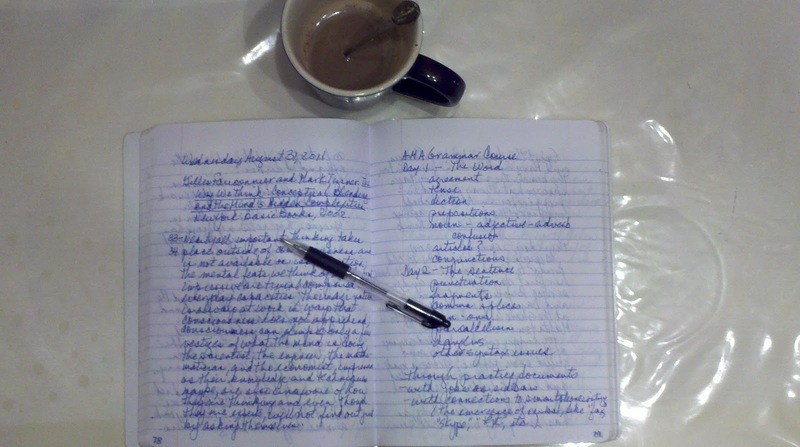 I read and write with my daily cup of coffee or occasional glass of wine, on the beach or in bed, in silence or with background music, or whenever, wherever, and however I can. 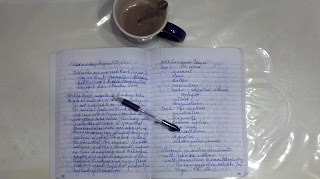 Sometimes I erupt into a euphoric state just because I have the gift of reading and writing. If you feel the same, count yourself lucky; if you don't, think of all there is to learn. improve in my teaching tips? contribute ideas to the fields of writing, teaching, and learning? help people develop their writing? reaffirm my commitment to writing, teaching, and assessing?